Wine Review: 2009 Augusta Winery Norton (Cynthiana) | Wine Splash! 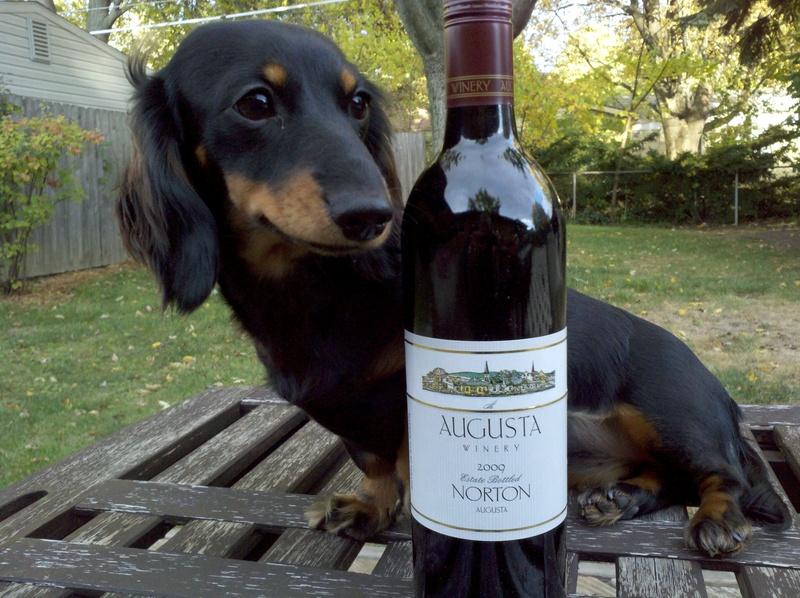 Our Wine Dox Daisy gives this Norton a 3 out of 4 Paws! There is a belief out there that wines that you buy from wineries while on vacation seem to taste better than what they really are. We have experienced this personally many times. You are having a great time, trying a lot of wines through the day, and the fun and atmosphere makes everything taste just a little bit better. Then you get home and open that same bottle of wine you loved on vacation and wondered why you bought it. Well, we are glad to say that this is NOT the case with the 2009 Augusta Winery Norton (Cynthiana). We visit friends in the Augusta, Missouri area every October and never miss the chance to stop by the local wineries. Augusta Winery is always a stop we look forward to on our wine weekend adventure! The bad news for us is that we just drank our last bottle of Augusta Winery Norton last night. The good news is that we go back to Augusta to visit our friends in 2 weeks! We are hoping it comes soon because we are already craving a bottle of Augusta Winery Norton now! On sight, this wine is so dark and rich, it was a purple color in our glass. We knew then it was a ‘Purple Teeth’ night for sure! On the nose, intense aroma’s of ripe black cherry, plum, and cigar box enticed our senses! On the palate, the mouthfeel was full bodied, juicy, with a medium tannin structure. There were wonderful flavors of black cherry, ripe plum, and soft herbal spices. The finish was long and elegant with notes of dried raspberry, cassis, and vanilla spice. We actually had a perception of an Amarone from the lush, jammy style finish! We bought this wine a year ago and it seems much more rich than it did back in 2011. We had this wine with a grilled steak with a Bourbon and Brown Sugar Marinade and it paired perfectly! We would also pair it with other red meat dishes, pasta with a tomato meat sauce, medium cheddar cheeses, and roast turkey or pheasant. This was a “WoW” wine moment for us and we can’t wait to restock this Norton soon! It is a great food wine but can stand on its own very well, thank you. We give the 2009 Augusta Winery Norton a 90 point rating which was well deserved. It is aging nicely and it is at full flavor right now. If you have a 2009 vintage, we would drink it by the end of 2013 at the latest. WineSplashing!